Depending on what type of person you are, you’re either going to think this is adorable or just downright disrespectful. 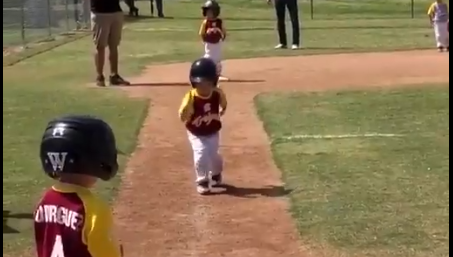 Over the weekend, a Twitter user posted a video of his younger cousin playing little league ball. At one point in the game, the coach asked the kid to run as fast as he could towards home to step on the plate. The kid decided to have some fun with it and run the entire way in slow motion. He even pushed off the coach who tried to speed him up. If that is what the coach told him to do and he did that the parents should not be cheering this on. looks like a kid being forced to play something he doesn’t like. I’m flying at him like an unblocked LB and putting him on the grass. This is great! You do your thing Little man! Awesome. Made my Day. He is a kid doing what kids that age do. He is mimicking what baseball feels like to some people….